How do I tell the kids about my divorce? A Create-a-Storybook Guide to preparing your children – with Love! Internationally-acclaimed ebook by Rosalind Sedacca. Please click on the book above for info & to order a copy. There are answers to your questions. There’s also a simple way to tell your children in a manner that eases their pain, reassures them of your love and helps them get through the transition that lies ahead. This is an actual template – the word-for-word text that tells you just what you need to say – in age-appropriate language for children 5 to 10 or 10 to 15. And then a step-by-step guide - for preparing an attractive personal family storybook, in a photo-album format, that your children will want to read. Please click on the book above to order a copy. Please click on the book above for more info & to order a copy. This quick, easy to digest audio co-parenting training program gives you the best strategies for co-parenting success during and long after divorce! Read it through once — then refer back when you need help, advice, support and proven tips for handling co-parenting challenges and frustrations more effectively. How can we show our love and compassion for our children as they move through challenges they did not ask for -- or create? Please click above for more info & to order a copy. Rosalind Sedacca, CCT partnered with Amy Sherman, LMHC to create court-affiliated anger management courses accepted by a growing number of counties across the USA as an aid to parents as well as children of divorce or separation. These take-at-your own pace 8- or 12-hour online programs are designed to help divorcing parents learn what triggers their anger, strategies for managing their anger, alternate ways for expressing their anger and the consequences of anger. Parents also learn more effective co-parenting skills to make home-life and visitations easier for the children in their care. 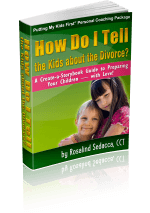 Combining easy-to-understand content, exercises, journaling, examples, videos and quizzes, the program is widely recommended by divorce therapists, coaches, mediators and attorneys as an aid to conflict resolution for co-parents before, during and after a divorce.